When I was 18 years old I made my first serious attempt to write a novel. I had written stories throughout most of my teenage years, including a teenage fantasy about the group I played in called “The Aristokrats”. The book was entitled “The Aristokrats in Spain”, and it ran to around 50,000 words. If nothing else, it taught me that I could write at length, but it could never have been described as serious. “Portrait” was different. It was a story of youthful love, disillusion and eventual tragedy. I was cutting my real writer’s teeth. And it was my first step on a long and difficult road that would be full of frustration and rejection. It was short, only about 25,000 words – not a commercially viable length – so my expectations were not high. All the same, I was excited when a letter from Collins Publishers finally dropped through the letterbox. It was dated January 25th, 1971, which seemed auspicious since it was also the birthday of the great Scottish Bard, Rabbie Burns. But, of course, it was a rejection. And although it might seem strange to say that I was uplifted, even inspired by this letter, that is exactly how I felt. 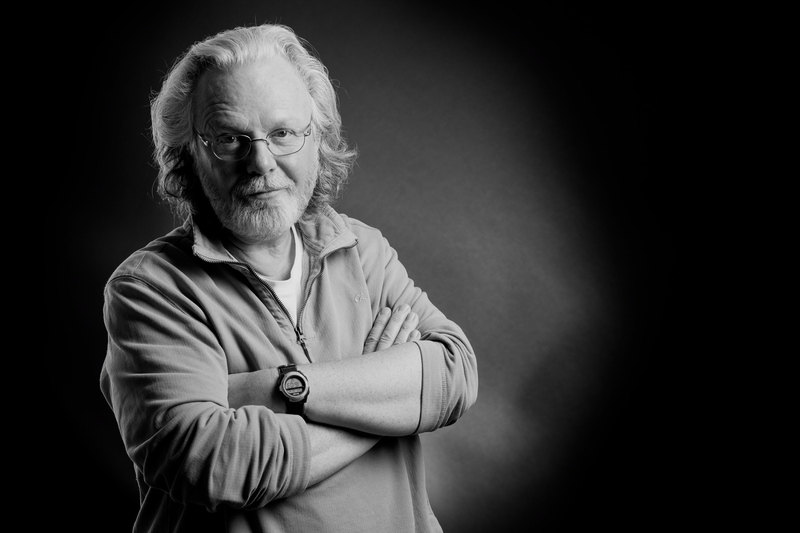 It was sent to me by an editor called Philip Ziegler, and his words of praise and encouragement are perhaps the only things that sustained me through all the difficult years that lay ahead. 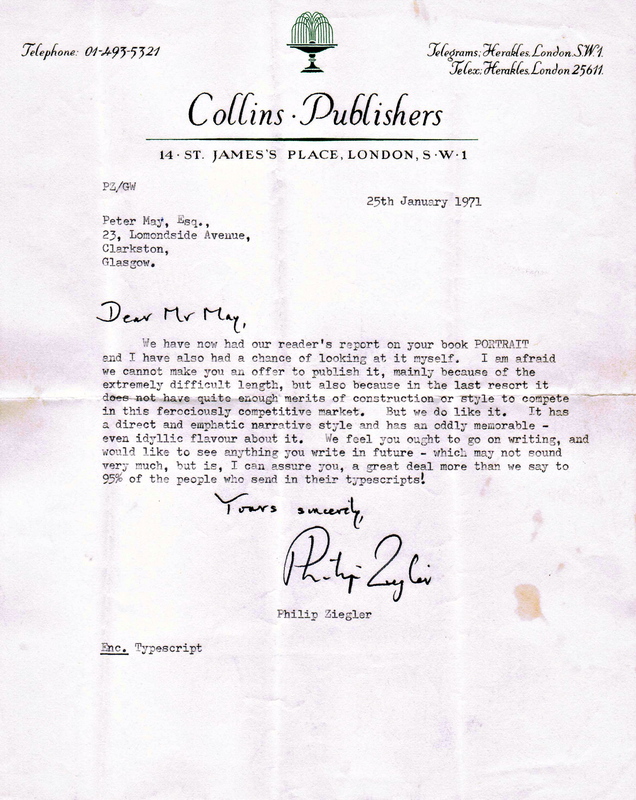 I sometimes wonder where I would be today if Philip Ziegler had not taken the time and trouble and care to reply to me with such thoughtful words. And I wonder, too, how many other writers might simply have given up because no one took the time to offer similar encouragement. I have guarded that letter carefully all my life, and today some instinct led me to it in a box of archives in the attic. I have scanned it, and you can read the letter in full by simply clicking on it. But the story doesn’t end there. Because 42 years later, Philip Ziegler is still going strong, and still being published himself. 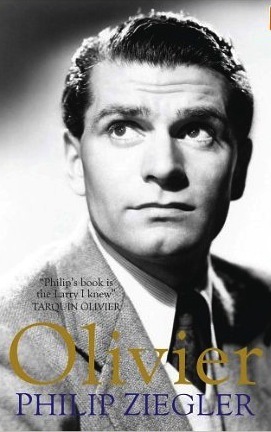 His latest book, “Olivier”, is the definitive biography of the actor Lawrence Olivier, and is published by Quercus who also publish my best-selling Lewis Trilogy. So nearly half a century later, I find myself on the same list, with the same publisher as the man who I have always considered to be my first and most important mentor. My heartfelt thanks to Philip Ziegler. Update: read about my meeting with Philip Ziegler here. What a fantastic story! I hope Mr Zeigler sees it. There’s a chance I might actually get to meet him next week in London. Very excited about it! That’s a lovely story. And it goes to show that you should never give up on your dreams. Hope you do meet him. Thank him from all us for encouraging you. Looking forward to your next book. What a great story..kind words go along way in helping us on our journey.Enjoy London and hope you can share some good times with him.Thanks for sharing;lifts me up! It only goes to show the difference between careless words and careful words. Not so sure there are so many careful words around these days. Oh,but how sweet they are when we encounter them!